ATMs are available in many parts of Singapore - ensure you inform your bank before travelling abroad, and be aware you may be charged for cash withdrawals. It is advisable to exchange some cash before arriving in Singapore. Visit the other Singapore city guide sections to get more detailed travel advice, and information on the best Singapore attractions and sightseeing activities, recommended shops and restaurants, as well as the best Singapore hotels. 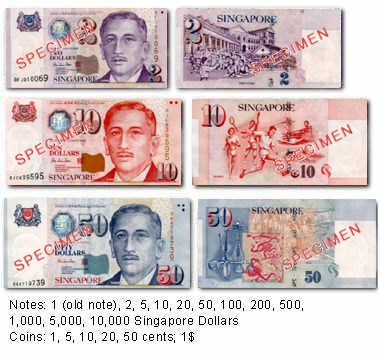 The main form of currency on the island is the Singapore dollar, which may be written as SGD, S$, or $. The Singapore dollar is comprised of 100 units, or cents. Gold and silver coins come in denominations of: $0.05, $0.10, $0.20, $0.50, and $1.00. Bills come in denominations of $2, $5, $10, $50, $100, $1000, and the rarely seen $10,000. Though it is rare, you may see a one cent coin. Many stores and restaurants will not accept this piece. While exchange rates fluctuate, the stable Singapore dollar is comparable to about $1.50 US or 2 Euros. Many shops and restaurants accept foreign currencies, but for those wishing to change their money, banks are typically open Monday through Friday 9:30am â€“ 3:00 pm, and Saturday 9:30am â€“ 11:30am. The exchange rates vary from bank to bank and some charge a service fee on each transaction, normally $2/$3 but ask first as the charge can be more. Currency exchange booths can be found in every shopping mall and usually offer better rates (moneychangers do not charge fees), better opening hours and much faster service than banks. The huge 24-hour operation at Mustafa in Little India accepts almost any currency at very good rates, as do the fiercely competitive small shops at the aptly named Change Alley next to Raffles Place MRT. For large amounts, ask for a quote, as it will often get you a better rate than displayed on the board. Rates at the airport are not as good as in the city, and while many department stores accept major foreign currencies, their rates are often not good. Moneychangers also sell a range of other currencies. Since many shops do not accept travelersâ€™ checks, it is a good idea to exchange these for cash with a moneychanger. Carrying cash is always somewhat risky no matter where you travel; Singapore has ample ATMs in malls, restaurants, hotels, stores, and more so you can withdraw the cash you need securely. Look for the Cirrus or Plus logos on your bank card to ensure that it will be accepted globally. Most often, withdrawing money from ATMs will result in one or more fees. It is not unusual for your bank to charge a fee, as well as the bank from which you are withdrawing money. There may also be an additional charge for foreign transactions. Major credit cards, including American Express, Diners Club, JCB, MasterCard, and Visa are widely accepted. In fact, many hotels and car rental agencies will insist upon full payment if you do not use a credit card. Note: be careful about shops which say they will charge a credit card surcharge. They are not allowed to do this. Save your money and find another shop. Visitors should plan on doing their banking early as typical hours are 9:30am â€“ 3:00pm and even as early as 1:00pm (as opposed to 5:00pm or later as is standard in other areas of the world) Monday through Friday and 9:30am â€“ 11:30am Saturday. Because Singapore is committed to its tourism industry, several banks in popular tourist destinations offer extended hours. POSB Ngee Ann City Branch on Orchard Road: 391 Orchard Road, Ngee Ann City. 6339 6666. Open Monday - Saturday 11:00am â€“ 7:00pm. POSB Centrepoint Branch on Orchard Road: 176 Orchard Road. 6339 6666. Open Monday â€“ Saturday 11:00am â€“ 7:00pm. POSB Suntec City Branch in Suntec City: 3 Temasek Boulevard. 6339 6666. Monday â€“ Saturday 11:00am â€“ 7:00pm. Standard Chartered Bank Suntec City Branch in Suntec City: Suntec City Mall. Open daily from 11:00am â€“ 9:00pm. OCBC Harbour Front Branch in Harbour Front: 1 Maritime Square. Open daily from 11:00am â€“ 7:00pm. Standard Chartered Bank Vivocity Branch in Harbour Front: 1 Harbour Front Walk. Open daily from 11:00am â€“ 9:00pm.